We're building snap-together model trebuchets that are perfect for office warfare or annoying your roommate! 1,876 backers pledged $96,248 to help bring this project to life. 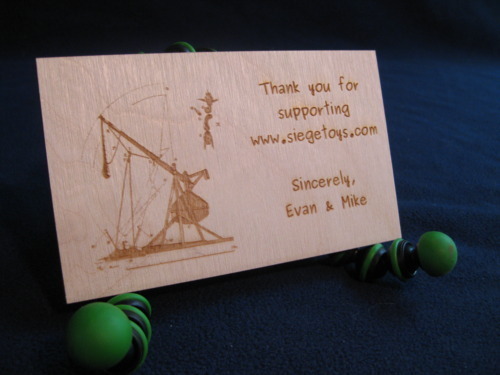 Now that our Kickstarter project is over, Trebuchette kits are available from our website at www.siegetoys.com. Trebuchets are pretty awesome. We think everyone should have one. Here's your chance! 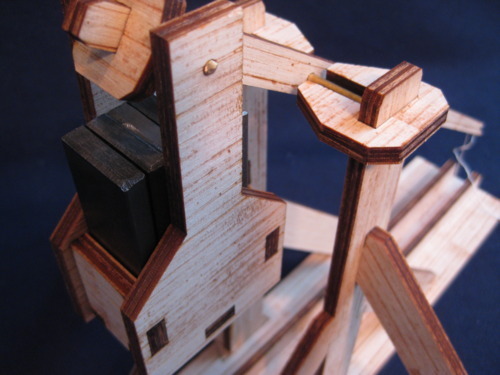 We've prototyped a full snap-together trebuchet kit that's perfect for kids and adults. They make a great classroom demonstration, learning toy, or addition to your office arsenal. 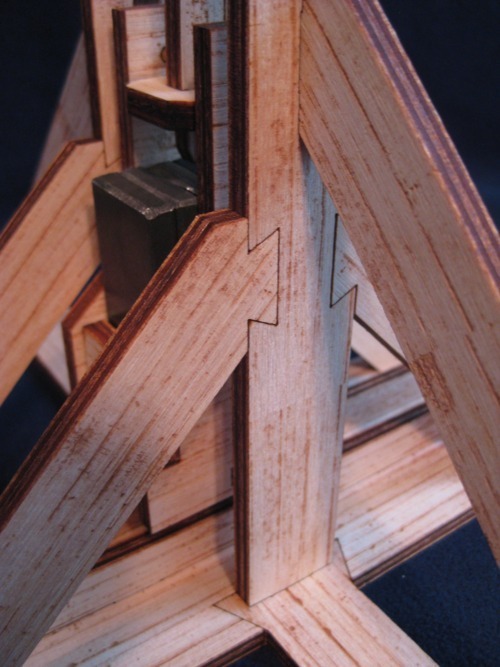 With our laser-cut kits, anyone can assemble their own trebuchet in 10 minutes or less and start flinging superballs at unsuspecting quarry. These little beauties stand about one foot tall in the ready-to-fire position (see below), and will throw a penny about 35 feet or a superball about 20 feet (maximum; for intra-cubicle battles, just use less counterweight). We've put a lot of effort into the design, to get all of the tolerances *just* right so that the pieces snap together perfectly, so you don't have to wait for glue to dry. The extremely precise laser-cutting process is what lets us get the tolerances good enough to make this a snap-together kit, no glue required. We'll be using the funds from this project to purchase a high-power precision laser cutter and other tools to make the trebuchet kits. The exact details of the starting material and the laser cut process are essential, so we can only make the kits for the price we want if we run the production ourselves. Read more about our costs here. We've called this an "Open Hardware" project, and we're be good to that word! We've already published our trebuchet plans as a common .svg file. It's free for anyone to download for their own use under a Creative Commons Share Alike Non-Commercial Attribution license. Trebuchet Kit: Comes with everything you need to get started slinging! With the trebuchet kit, you get all the laser-cut, snap-together, wooden pieces, 2 brass axles, a leather sling, 6 steel counterweights, and 2 superballs! Assembly time: only 10 minutes! Stand-up Targets: These come with the Battle Pack or Super Pack! The Battle Pack comes with 6 targets, and the Super Pack comes with 12! 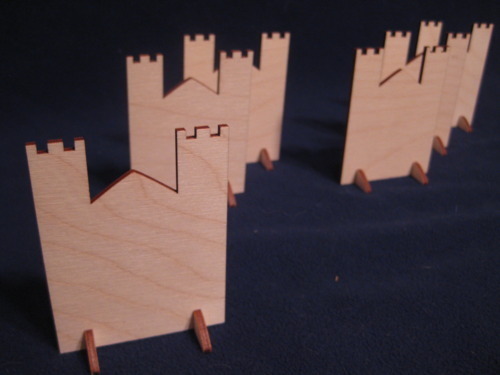 These laser-cut castles are made of 1/8" Baltic birch plywood, and also snap together, just like the trebuchets! No glue required! Assembly time: about 10 seconds each! Collector's Edition Trebuchet: Here are some closeups of one of our art patterns (this is the wood-grain pattern; we're also working on geometric-construction and scrollwork art patterns) for the collector's edition trebuchet. These come numbered and signed, and are fully functional, including the brass axles, leather sling, counterweights and superballs you need to get started! Custom laser-engraved photo: Our most generous donors will receive a custom laser-engraved photograph of your choice. Once the Kickstarter project has successfully completed, we'll ask you to email us the photo that you want engraved, and we'll include the finished product in your reward, alongside your trebuchets! Finally, if you'd like more than one of any level, go ahead and pledge the correct amount for the combination of rewards you'd like, and send us an email or message to confirm. We're happy to make up any combination order, but we need to know what you want! We'll mail you a thank you postcard, laser-printed on 1/8" birch plywood! 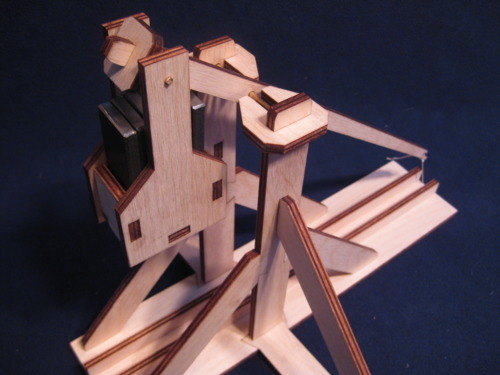 A snap-together, model trebuchet of your very own! You get the full kit, with everything you need to commence bombardment in ten minutes or less! Battle Pack: 2 full trebuchet kits and 6 stand-up targets! Give a trebuchet to a friend and duke it out, or join forces against the break room! Collector's edition trebuchet: A full trebuchet kit, but the sides of the trebuchet will be engraved with one of our art patterns. Numbered and signed! Super Pack: 2 full regular trebuchet kits, 1 collector's edition trebuchet kit, and a dozen stand-up targets! 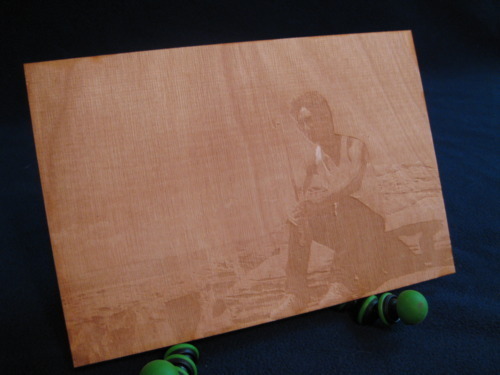 You get everything in the Super Pack, plus we'll custom laser-engrave any image of your choice onto a piece of hardwood! Plus, if you're in the bay area, we'll give you a tour of our shop and take you out to dinner!